And the options for assembling are pretty much endless. You name the vegetable and I’ve probably added it to my scramble. A couple of days ago the fridge was getting a little bare so I did what any lazy girl who wants some breakfast would do. I used what we had on hand: some thinly sliced uncured beef hot dogs (why am I so obsessed with these?! Send help. ), snap peas, arugula and a little parmesan cheese. But guess what? It was delicious! There’s something about the soft fold of well seasoned eggs that can adapt to just about any flavors you wanna throw at them. 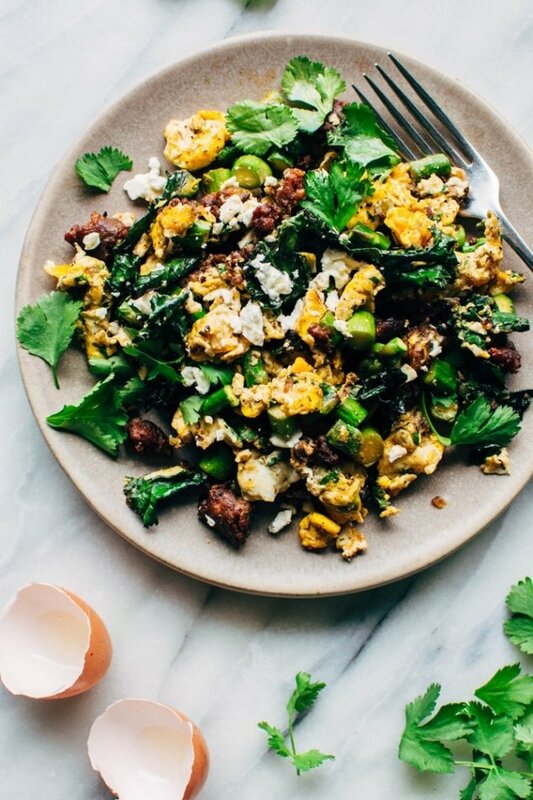 But for this particular recipe, we’re going to talk about the deliciousness that is this easy chorizo and asparagus scramble. 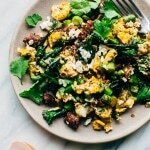 It’s a fairly savory scramble, with a bit of spice, some sincere green vegetables and the perfect salty kick with each bite. Asparagus – the spring and summer veg that’s pretty much my favorite for any meal. Kale or another leafy green – that wilted bunch in the back of your produce drawer? This is the perfect time to use it. Red onion – or white, or green, whatever you have on hand will work! Cilantro – my forever fave herb. Salty feta cheese (if that’s your thing) – the scramble will definitely float without it, but it adds a nice salty punch to the finish of the dish. This recipe comes together quickly. Particularly if you have some already cooked chorizo crumbles ready to go in the refrigerator. But if it’s not already cooked, don’t stress it. Just do that before you start the recipe and you’ll be ready to go. 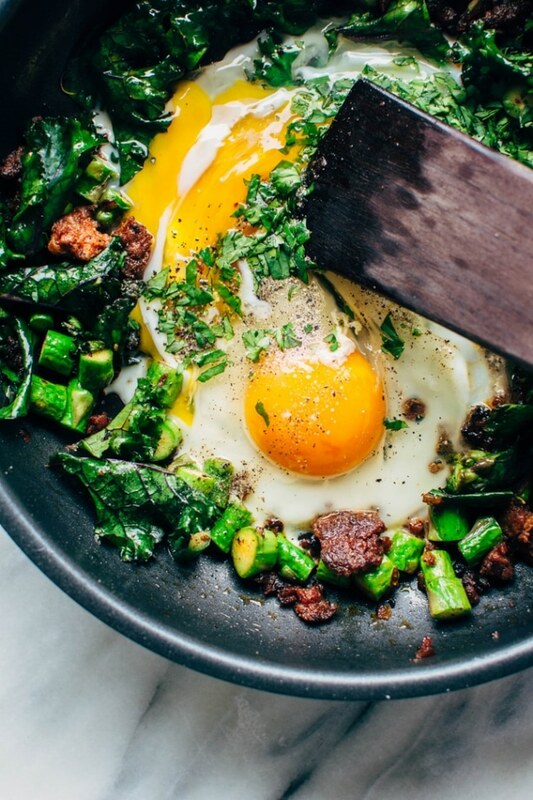 After the chorizo is ready, sauté a little onion in the same pan, and once it starts to soften add the asparagus and kale, cooking until it’s just turned bright green. 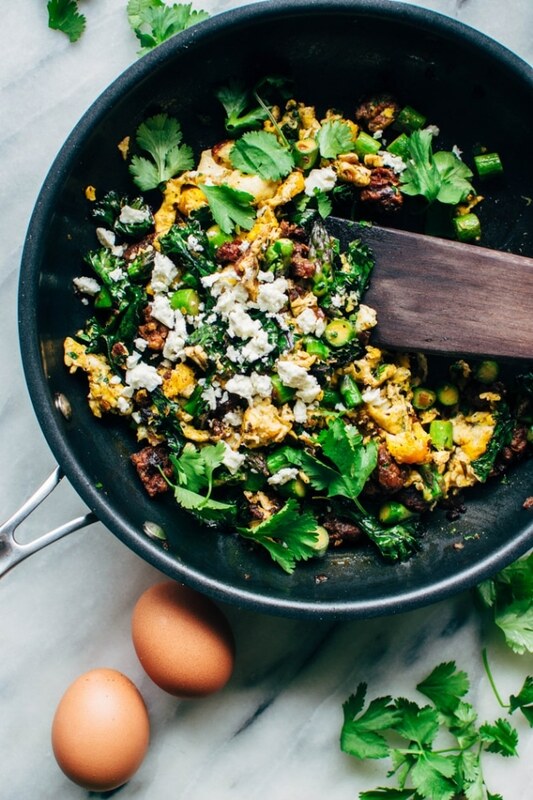 Move the vegetables to the outer edge of the pan, and the eggs will get cracked right into the center, seasoned with salt, pepper and some chopped cilantro, and then gently cooked, eventually folding in all the tasty goodies waiting around the edge of the pan. The recipe listed below is for a single, satisfying serving, but it can be so easily doubled or tripled to feed more bellies! 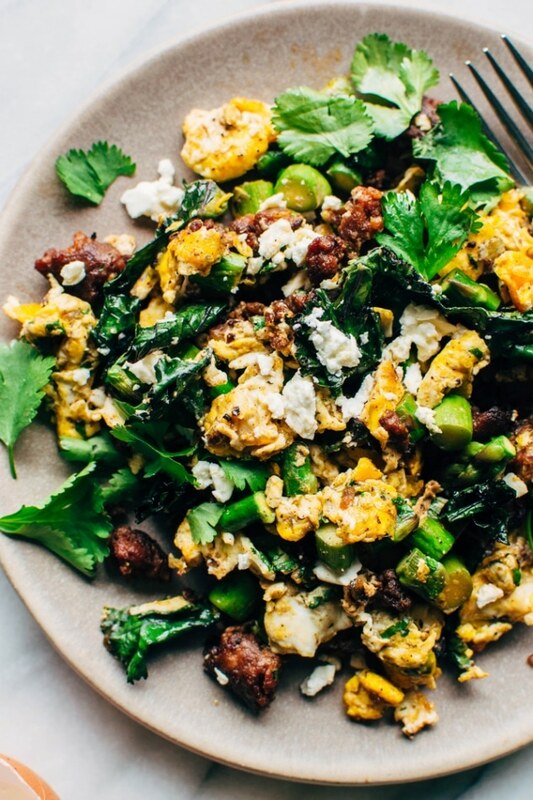 Made with only 5 ingredients, this easy chorizo and asparagus scramble is a breakfast hero. Plus it’s healthy, quick and SUPER easy to make! Add 1 tsp ghee and onion to pan, cook for several minutes, until onion is soft. Add already cooked chorizo to the pan and heat until crisp. 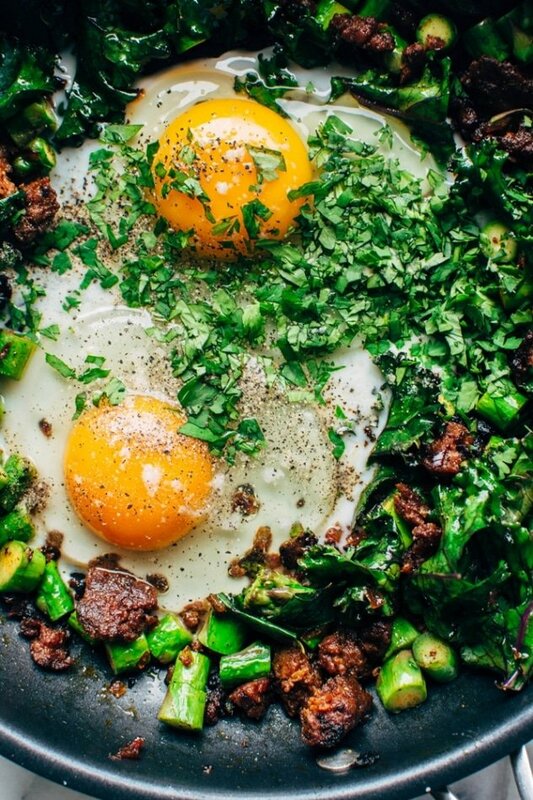 Create a circle in the center of the pan and crack in eggs. Season with salt and pepper and add cilantro. Stir to scramble eggs, without incorporating too much off the goodies on the edges. 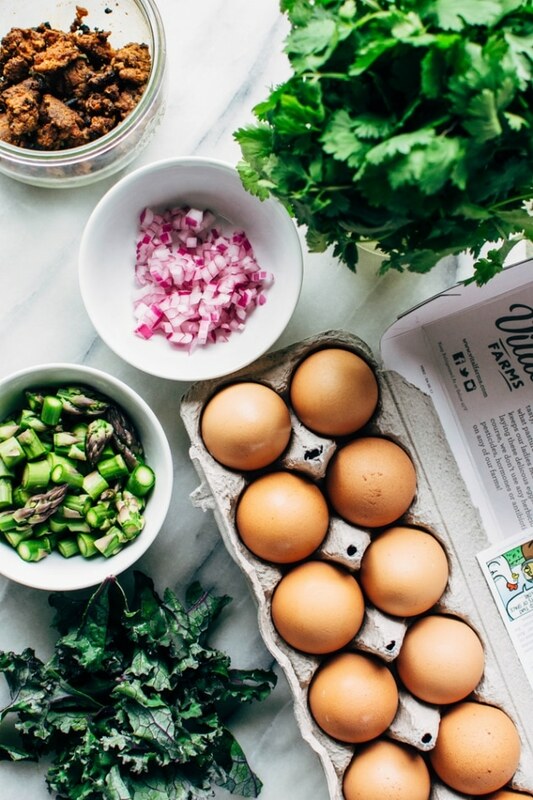 Once eggs are about half way cooked, gently fold the asparagus, chorizo and kale from the outer edge into the eggs. Stir gently and cook another minute or two until just barely set. Sprinkle with feta cheese (if using) and dig in!